The finalists are Negar Ahkami, Akea Brionne Brown, Cheeny Celebrado-Royer, Schroeder Cherry, Phylicia Ghee, Jackie Milad and Stephanie Williams. The Baltimore Office of Promotion & The Arts (BOPA) announced Tuesday the finalists for the 14th annual Janet & Walter Sondheim Artscape Prize, five of which have ties to the Maryland Institute College of Art (MICA). Brown ’18 (BFA Photography and Humanistic Studies, Sustainability and Social Practice) is an emerging photographer who investigates the implications of historical racial and social structures in relation to the development of contemporary black life and identity within America. Celebrado-Royer ’10 (MFA Mount Royal School of Art) is a multidisciplinary artist who uses detritus from art packaging materials, recycled and found objects, as well as studio trash to create intricate wall installations, sculptures, paintings and drawings. She is currently the artist-in-residence for the post-baccalaureate program at MICA. Ghee ’10 (BFA Photography) is an interdisciplinary visual artist, photographer and curator. Her artwork documents transition, explores healing, ritual, ceremony and personal rites of passage. Milad creates textured works on paper and canvas. Her artwork has been featured in group and solo exhibitions nationally and internationally. She is faculty in the Curatorial Practice MFA program at MICA. Williams is a tinkerer and doodler whose work navigates hierarchies of taste. She currently teaches stop motion for the Animation Department. 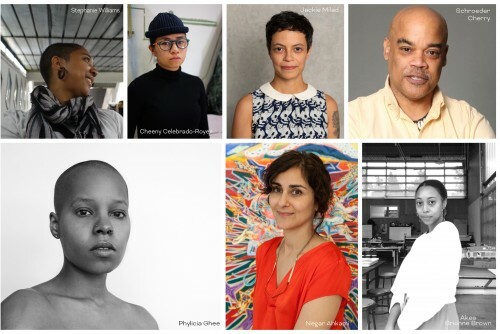 This competition awards a $25,000 fellowship to assist in furthering the career of a visual artist or visual artist collaborators living and working in the Baltimore-Washington metropolitan area. Each finalist not selected for the fellowship is presented with an M&T Bank Finalist Award of $2,500. Finalists will exhibit at the Walters Art Museum, 600 N. Charles St., on Saturday, June 15 through Sunday, August 11, and the winner will be announced at an award ceremony and reception at 7 p.m. Saturday, July 13. The exhibition and ceremony are free open to the public.